The A5 fills a unique place in the luxury-car market. With car designers trying out the most extravagant styling on entire car lines, Audi has found a look that's both striking and beautiful. It's one of the few cars on the road today that will draw stares without being awkwardly styled. 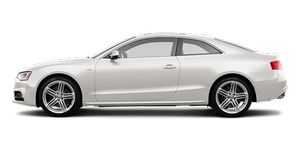 The A5 also holds a place for buyers looking for a solid blend of performance and comfort, whereas the BMW 3 Series and Infiniti G37 are squarely aimed at enthusiast drivers. While that may keep speed demons away, the A5 remains a confident highway performer that's also comfortable. As usual, I find the main drawback of the A5 to be its pricing: Audi — along with other luxury German nameplates — offers expensive option packages. If you can settle for just a few minor upgrades, the A5 remains reasonably priced for what you get, but just adding navigation adds considerably to the price. At $43,000, the A5 is competitive, but at $57,000 a whole world of alternatives comes to mind. Perhaps the A5's looks alone will outweigh its cost.